The array of person-to-person payments options is dizzying. Which is right for your community bank? Let us break down the options for you. One trillion dollars. That’s the amount U.S. households transferred via domestic and cross-border p2p payments in 2017, according to Aite Group. This is up 111 percent from 2014. 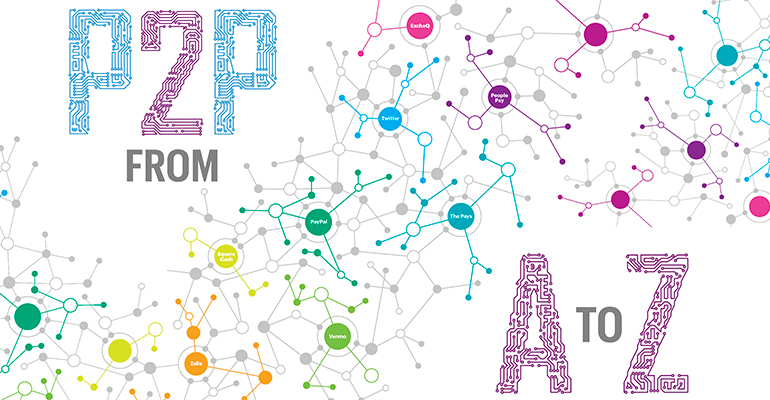 It’s safe to say that p2p has now firmly rooted itself in the American payments ecosystem. Within that explosive growth are pockets of increase on particular platforms. For example, bank-centric solution Zelle has catapulted ahead of Venmo transactions as of the second quarter of 2018: Zelle reported 100 million transactions and $28 billion in payments, while Venmo logged just over $14 billion in volume. What’s driving this growth? 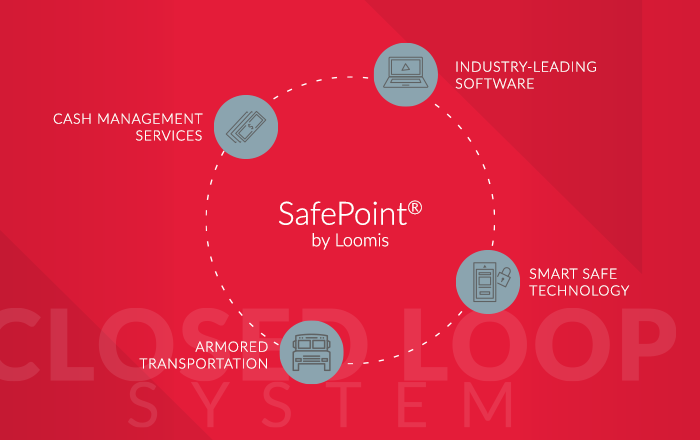 For one, p2p has become a more ingrained solution in the industry. It’s no longer just early adopters who are jumping on the p2p bandwagon. At this stage, the early majority and the late majority have come into play. According to Zelle’s Digital Payments Adoption Study, more than 75 percent of millennials have used online or mobile p2p payments. Generation X is a close second at 69 percent, and baby boomers aren’t far off at 51 percent. To that point, p2p usage is growing because of the sheer fact that it is a fast and easy way to move money. From apps that allow for in-house account transfers to full-blown p2p solutions that send and receive to any account, many institutions have rolled out an initial offering, increasing the number of transactions and the number of users. And with this increased demand by banks, core providers are motivated to enhance their offerings. These upgrades result in better, more intuitive products for consumers and solutions that take the friction out of the implementation process for the bank. Essentially, the whole payment chain is simplified. But for community banks that are looking to upgrade an existing p2p option or launch one for the first time, competing solutions with varying pros and cons make the decision difficult. The good news is that there are a host of solutions that community banks can consider. To make the choice between them, banks need to reflect on their business strategy, balancing pros and cons, costs and benefits, and future opportunities. There really are two kinds of p2p solutions: those secured within a bank and those that leverage bank accounts but operate outside the traditional banking infrastructure. Both have upsides and downsides for the end user. For the bank, there’s a clear benefit to keeping the transactions close. However, there may be a higher cost associated with this approach. So what’s the best option for a community bank? It pays to weigh up the choices. Let’s take a closer look at some of the major players. ExcheQ, developed by $500 million-asset North American Banking Company in Roseville, Minn., answers the p2p call by utilizing the ACH Network via an app. It allows for same-day settlement by leveraging Same Day ACH, but it also can settle within traditional ACH windows. While it doesn’t have the social components of other p2p solutions, it creates a simple, safe way for community banks to use existing infrastructure—with limited added costs. People Pay is FIS’ p2p solution that enables customers to send and receive money from a smartphone, tablet or desktop—securely and in real time. However, it is a “send” network, and to receive payments in real time, recipients need to use a MasterCard or Visa debit card. It is core-agnostic, so if FIS isn’t a community bank’s core provider, it can still be an option. Fiserv’s p2p solution, Popmoney, moves money directly from one bank account to another. It is not a real-time solution on its own, but it gives the option of Popmoney Instant Payments, which provides real-time funds delivery. It, too, can integrate with other systems, so all community banks have the choice to use Popmoney. It does publicize transaction fees for sending payments, which is something banks will have to consider with all p2p solutions. The emerging frontrunner, Zelle is a p2p service developed by the nation’s largest financial institutions. As its own network, Zelle offers near-real-time payments and funds availability within minutes. It works with a bank’s own app, and there’s also a Zelle app option. For consumers, there’s a quick enrollment process and then they are set up to send or receive to nearly any bank account in the U.S. Zelle has a powerhouse promotional engine behind it—an advertised $40 million marketing spend—but with that brand recognition comes a price, which is something community banks will need to factor into their p2p plans. Fintech companies offer competition in the p2p space, using the payments infrastructure but taking the transactions outside of the financial institution. These players exist because electronic p2p payments were a point of friction historically. The fintechs wanted to offer digital solutions that simplify payments. Let’s run through a few of the fintech offerings. The p2p solution with the longest history, PayPal offers brand recognition and established accounts for users. Yet, the company appears to be driving more of its p2p efforts into its Venmo service. It does, however, emphasize growth in overall payments and accounts, demonstrating the potential for a bigger banking experience. Social media platforms have gotten into the p2p payments game with limited success. Snapchat closed down Snapcash earlier this year. Twitter appears to be more focused on its original mission but is allowing other providers to leverage its network, including cryptocurrency solutions. Facebook Messenger has seen some success, mostly with one-off payments that move money via debit card. But don’t count them out: These social media solutions have the advantage of meeting users on channels where they are already engaged. It’s a p2p solution, but Cash App (from Square) positions itself more like a bank account with a cryptocurrency bent. It is less focused on emphasizing p2p payments, listing them as one option. Instead, it publicizes users’ ability to direct deposit to the app, save with it and make purchases with it, including buying cryptocurrency. It has launched a rewards program, Cash Boost, to encourage people to make payments from the app or from the corresponding credit card, Cash Card. They’re individualized solutions, but Apple Pay, Samsung Pay, Google Pay and their ilk function in a similar way, presenting a digital wallet experience. They offer p2p and in-store payment functionality, and they allow users to connect their accounts and cards. Because they use infrastructure customers already have, often coming standard on the device or linked automatically to an email account, the Pays have a built-in potential user base. 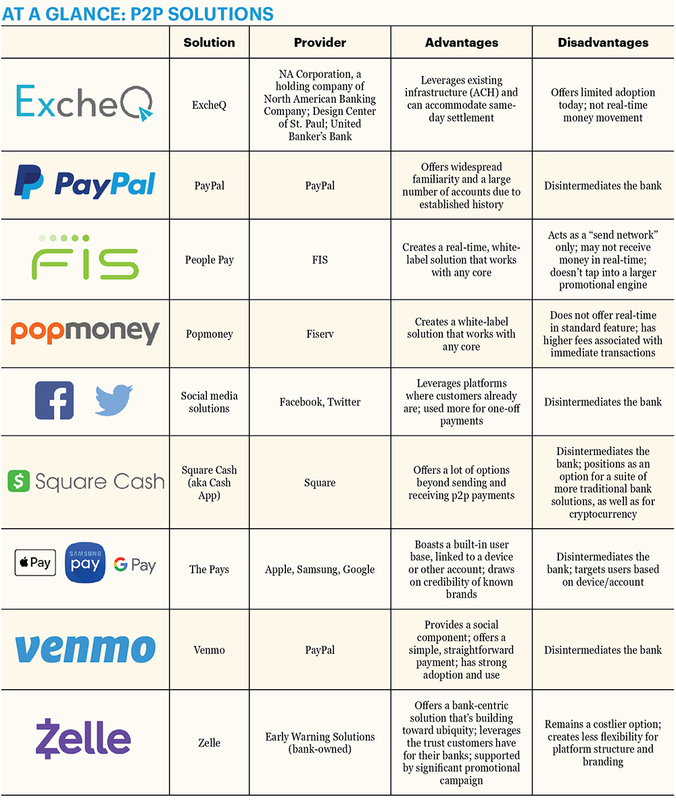 Venmo is often considered the biggest competition for bank solutions. It positions itself as a free digital wallet for U.S.-based transactions. The social sharing aspect of Venmo has contributed to its popularity, as has its ease of use. Transactions are free for standard payments via bank accounts, debit cards or Venmo balances; there’s a 3 percent fee for credit card transactions and a $0.25 charge for instant payments. What does it cost to offer p2p? No matter how you slice it, it will cost your community bank money to launch and maintain a secure, relevant p2p product. There are varying upstart costs, transaction fees and promotional expenses that community banks will need to weigh as they consider various solutions. And, with a precedent set that standard p2p payments are free, charging for them won’t get a bank very far. So, perhaps the better question to ask is: What is the cost of not offering p2p? p2p is clearly here to stay, and while it raises challenges for community banks, opportunities loom large. To embrace the full potential of p2p, community bankers must anchor their decision-making around their institution’s strategy. By identifying the right solution for their current and future customer base, p2p will spell success for community banks. Colleen Morrison is a writer in Washington, D.C.